The Kiowa tipi sleeps up to ten people and provides a large living space and front porch. The zip-in groundsheet has a zip to the centre alloy pole, enabling it to be rolled away at the door to create a safe area in which to use the optional stove and place wet gear. The neat new Internal Apex Vent Control that can be easily opened and closed from inside works with the large mesh panels behind the zip-open windows to control air flow while keeping bugs out. Sprung apex vent cowl is a simple and highly effective solution to controlling airflow. Elasticated stovepipe port allows the use of a solid fuel stove designed for tent use. Guyline retainers hold folded guylines securely when packing away to avoid the nightmare of tangles and knots. Mud valance doubles as draught strips on porch entrances. Standing Height in the living area for more comfort and freedom to move and dress. 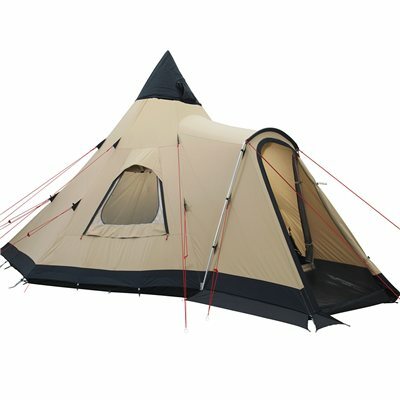 Zip-in groundsheet with twin zips that enable it to be folded away from the door to create a wet area. Mains cable access through a zip opening in the flysheet. Mesh with mosquito netting for ventilation and to keep insects out.